I went back and re-tested everything again. It seems specifically to be an issue with using a Tracer and an Emitter as the inputs for OffsetY. Here's a gif showing the result I'm getting. I'm not sure how to embed it like you did. Hello, I know its been a while since I last posted on this thread by I've finally had enough time to go over the wonderful example you provided. I assumed I should reply in this thread instead of making a new one though. It works in all the circumstances that I've been testing it in, except for one, which is great! So I had two followup questions. The current problem I'm running into is when I make it editable it while using a Tracer object(It also happens with connect and spline mask objects) I get an error and it breaks in these lines of code in GetContour(). # Retrieves a Clone working spline. When not making it editable and just playing through the timeline it returns it perfectly though. The difference in the two circumstances seems to be whether GVO or GetContour is being used to return the spline. GVO is used when moving frame to frame, but GetContour is used when making it editable. So my question is in regards to using both GVO and GetContour. I thought GVO should be used for returning objects and GetContour should be used when returning splines but in this case both are used, although the latter is breaking. Is it acceptable practice to use both of them and should I switch it to always use GVO so I can get the correct output? No worries about the wait, Maxime. I'll have to spend some time looking into all of it! Thanks you for such a through response. Hi, Maxime, I'm trying to be able to browse through every point, the tangents of those points, and the segments they belong to. It seems like a LineObject wouldn't help me get the tangents or the spline point locations so I think I would need the actual SplineObject. I want to output a SplineObject, taking in the input splines points, tangents, and segments to be able modify it and return something different. Thanks for taking a look. I was hoping there would be a way to avoid doing a bunch of cases to cover exceptions such as the Instance object. There would be other objects that could take a spline in that I would have to find the reference to as well, and while I could locate them by hand it seems like something that would be possible via Cinema. If GetAndCheckHierarchyClone() turns up anything I would be interested in hearing it. Hello, I'm trying to get the Spline Objects from the child objects of a Object Plugin I'm making, then I want to modify them and return them vie GetContour(). I've been using GetRealSpline() and that has been working pretty well, but there are a couple cases that it doesn't work. Circle returns a spline, but Circle Instance doesn't and I get the same results in C++. I've been looking into GetAndCheckHierarchyClone() and it seems like that would get me the proper object to use GetRealSpline(). on. But GetAndCheckHierarchyClone() needs HierarchyHelp which is in GVO(), but since I'm working with a spline I've been using GetContour() for my work. So my question is in C++, if I should be using GetAndCheckHierarchyClone(), and if so how would I get access to HierarchyHelp help or if there is a different way to reliably get the Spline Object from a child object. Thanks for the first response. My bad with not catching that it was a layer shader bug, I figured I had done something wrong with the sampling. I'll start looking into the other projection samplings. Hi again Riccardo, sorry about another late response but I was finally able to go through your code again. I see where I when wrong in understanding where the Flat projection stuff would take over. Going through your code I saw a few things that didn't make sense to me and I just want to make sure I went about them in the right way. 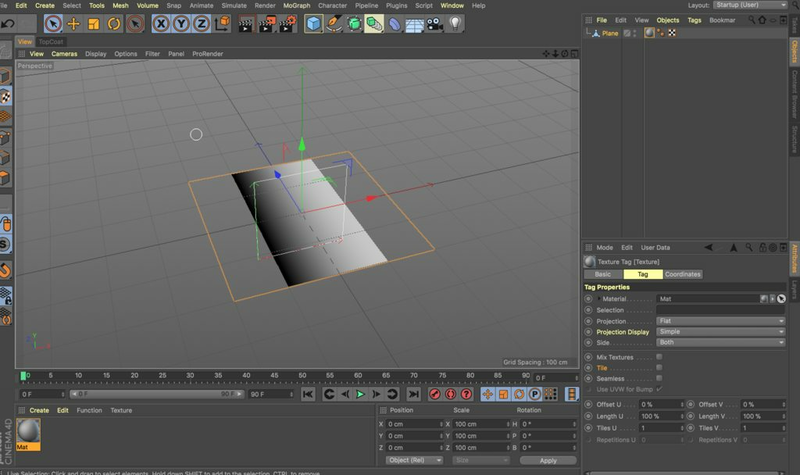 spot1 = 0#These need to be swapped to c4d.Vector(0), since later on it's looking for a vector. uv.y = (d.y * .5 + mappingInfo["oy"]) * mappingInfo["invLeny"] + 0.5 # this needs to be changed to "-(d.y * .5 + mappingInfo["oy"]) * mappingInfo["invLeny"] + 0.5"
Without changing it to minus in your checkerboard example doesn't seem to return the correct color samples. I was getting Vector(0,0,0) when I should have been getting Vector(1,1,1) and vice versa from what I could tell. Swapping uv.y to the minus seemed to fix that. Then I tried a new test with a new material, each quarter of it being a different color. Even with my 'fix' I was getting incorrect outputs. After all of that I still have one more question: where the end +.5 came from for the last bit of code. They are missing from the TexData example, but from what I can tell it needs them to function correctly. I'm just worried in doing the other projection types that there will be an unknown variable that I don't know that I need to add. Again, thank you so much for all of your help, Riccardo. If I figure it out I'll be sure to post it. I've been trying to get some of the other projection types to work but I've been having trouble with them. So I went to Flat Projection since it seems like the simplest one on the list. Modifying your code with it though isn't giving me the sort of outputs I would be expecting. I took texdata["im"] to mean the inverted matrix of the Texture Tag because of the documentation saying "The inverse of the texture projection matrix. " Because of the default scale of 100 on the texture tag it was making everything really tiny, so I started to use GetNormalized on texdata["im"]. Even in that case it wasn't outputting what I was expecting. I modified your output to show what TestFlat() was returning and what was actually being sampled. Given a normal flat texture I thought that flatprojection would go from vector(.25,0,0) to vector(.75,1,0), but it's actually going from vector(0,-.5,0) to vector(.5,0,0). The latter seems consistent with the code I wrote, but that doesn't seem to be what give the correct output. Here is my current setup, with a simple gradient texture and a one polygon 200x200 plane. Am I still missing something? Am I wrong about what matrix texdata["im"] is supposed to be? The flat projection could is simple enough that I don't see many places where I could have made a mistake. No worries about the wait, I really appreciate all of the help you've been giving me. I'm going over the code you provided and working to implement one of the other projections to make sure I properly understand it. With the code you provided I'm confused about the handling of tiling. Why is it necessary to implement return True if it is tiling? Would just taking the modulo of the uvw.x and uvw.y not work? In my few tests it seems to do the job.